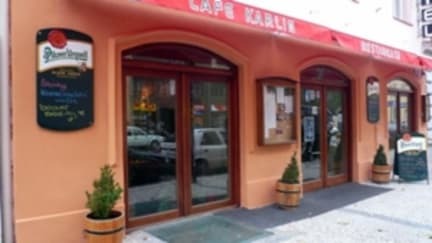 Hotel Karlin, Praga, Czechy : Rezerwuj teraz! If cancelled up to 4 weeks before date of arrival, no fee will be charged. Beautiful Hotel Karlin is a recently renovated family hotel near the historical heart of Prague at Sokolovska Ave. Just 2 stops to the historical centre by underground or 3 stops by tram or 10 minutes by walk. It is easily accessible by both the city transport and arterial roads. Hotel offers comfort of 3+ star hotels. All rooms have own bathroom, cable TV with 43 channels, WiFi free. Guests can enjoy dining at Karlinsky Mlyn Restaurant next the hotel which serves Czech and international dishes. 'A hearty welcome', 'a pleasant and cosy setting', 'readiness and helpfulness of the staff are expressions that undoubtedly give a true picture of the atmosphere in our hotel. All of our employees will do their best to provide you with maximum comfort and quality services to make your stay in Prague most agreeable, our primary objective being your satisfaction and return visits.